Francis Greaves in Ireland sent me this updated diagram of his system that uses two LDR controllers for a heating system plus the over-voltage trip that I designed for him. 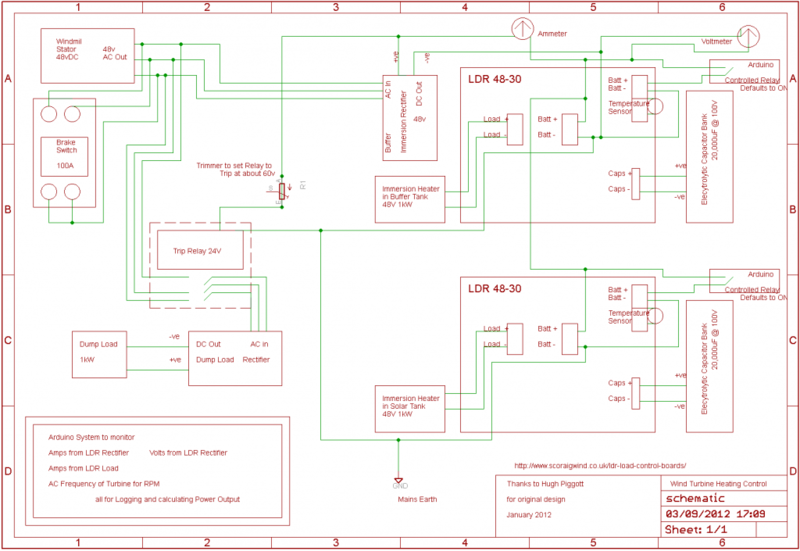 More about how to use the LDR controllers from Solar converters on this page. “The 2 LDRs (each controlling the Immersion Heaters) are switched on and off via relays as you suggested using the Batt+ lead. The relays default to both ON. I got a dual element immersion from T P Fay, don’t know why I did not think of this before. A 3kW 240v AC element and a 1kW 48v DC element to go into the hot water tank which is also heated by Solar Panels. I have the other 1kW 48v DC element in the Underfloor Heating Buffer Tank. I have a trip to switch overvoltage into a 1Kw Dump Load. This seems to work very well indeed! In the 2 weeks I have had the system running I have left the Mains input to the Solar Tank Immersion off. There has not been a great deal of wind, but between the Sunshine and Wind I have had plenty of hot water. There is a nice graph showing the Solar and Buffer Tanks in use during a 24hr period in the ‘progress’ part of the web site.